Counting and exploring numbers is easy to do when you are out and about and when you are playing at home. 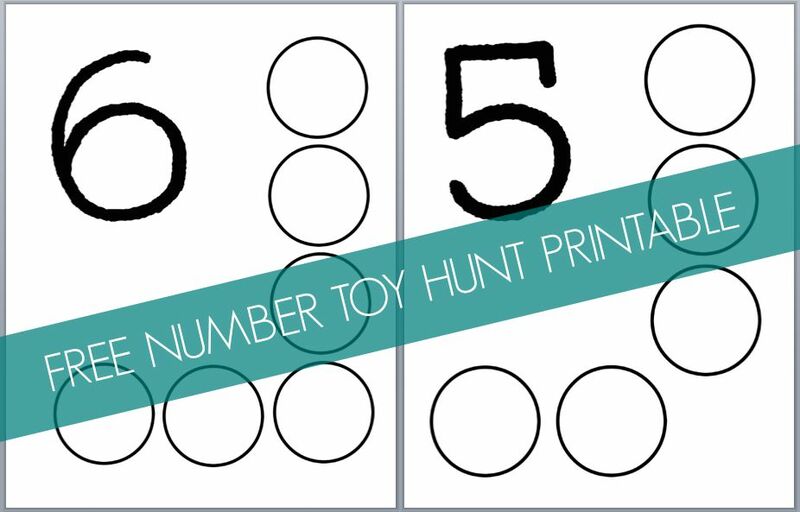 Today we are sharing a simple Number Toy Hunt activity that you can do at home using a few simple materials and your child's favorite toys. This activity is part of our third annual Back to School Basics series that we kicked off yesterday. Over the next few of weeks I'll be sharing some Back to School Basics posts that review simple math, reading, and writing skills for preschoolers, pre-k students, and kindergarteners. We will also be sharing activities that practice preschool concepts like colors, shapes, alphabet letters, numbers, and name recognition. Today's activity will focus on counting and number recognition. Yesterday we shared a simple name art activity and game. To get started with a number toy hunt you will want to write a number on each piece of cardstock. Write the number BIG with a marker. Then draw circles or squares that correspond to that number on the cardstock. For example, if the number is 5, draw 5 circles on the piece of cardstock. You can also just print out our FREE Number Toy Hunt Printables here for numbers 1-10. We only printed out a few at a time so that it wasn't too overwhelming for my kids! Next tape the pieces of cardstock to the floor so that they don't move around. After that, encourage your child to find ONE toy to go in each circle on the card. Then have your child COUNT all of the objects on that card and say the number! If your child counts incorrectly or keeps counting past the number, just model the correct way to count up and say the correct number on the card and move on to the next one! 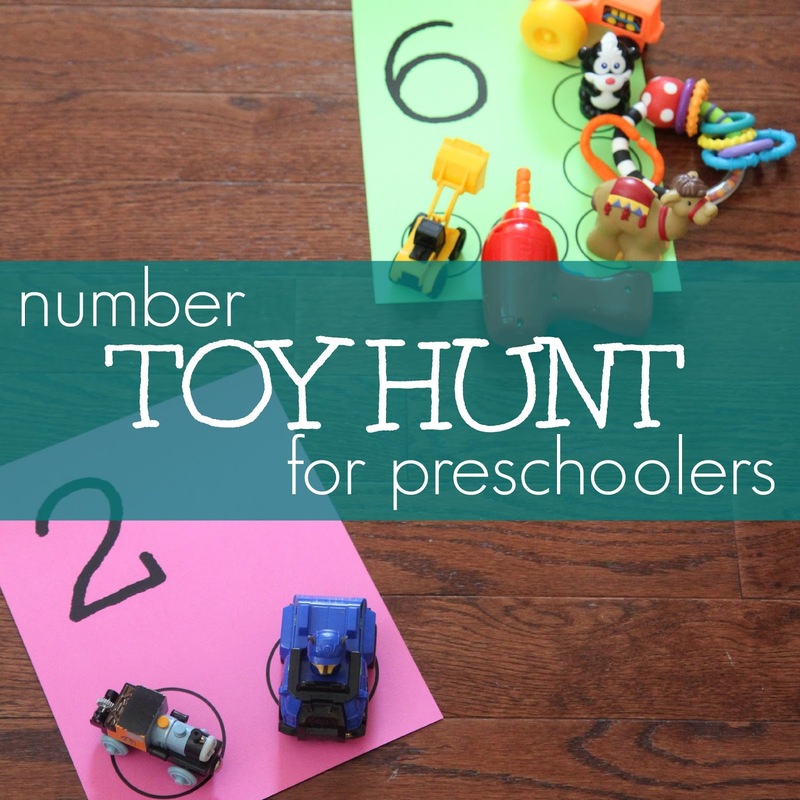 Over time your child will get more and more correct as he practices counting more often! This activity is so simple but I love how it gets kids moving, playing, and thinking about numbers. 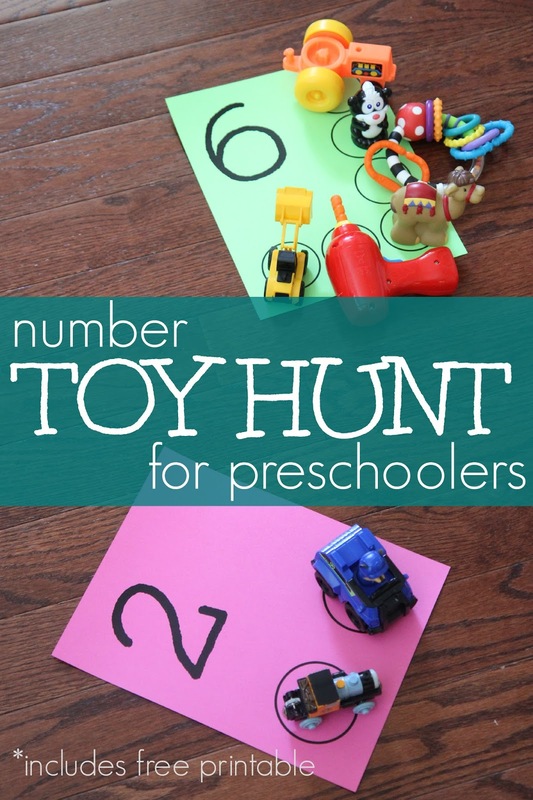 Need some other number recognition or counting ideas? 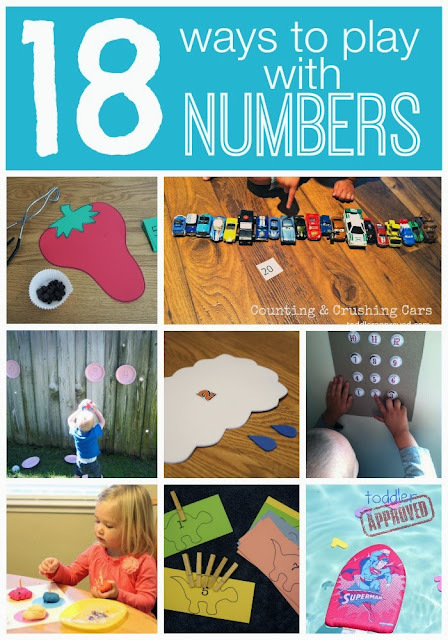 Try out some of these 18 ways to play with numbers!